Last week's piece that announced craft beer's emerging control of Portland's beer market drew a firestorm of traffic, a lot of it from reddit.com. I like that. It also drew quite a few 'Hoorahs!" from folks happy to see the news. 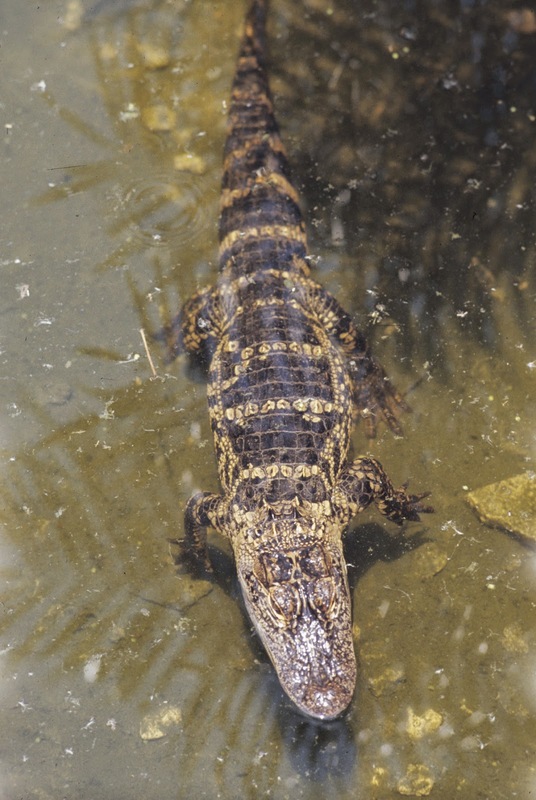 Alas, the data from which the conclusions were drawn might be considered a crock. Don't misunderstand. The numbers are accurate as far as they go. It's just that they're wildly incomplete in several ways...which I'll get to. They paint only a sketchy picture of what's actually going on. The blunt reality is that craft beer is almost certainly in a far more dominant position in Portland then last week's piece suggested. The overriding reason for the disparity is under-sampling retail and complete blindness to draft sales. You will recall that IRI (Information Resources, Inc.) is the market research organization that buys scan data from grocery stores, convenience store chains, etc. Good stuff, as far as it goes. Let's first deal with under-sampling in packaged beer. Because the IRI buys data mostly from large grocery stores and chains, it leaves a huge amount of significant data on craft beer (and other stuff) on the table. How can that be? The answer is that Portland (like a lot of cities) has a large number of independent (mostly small) grocery and convenience stores that aren't part of IRI data collection. Specialty stores like New Seasons and Whole Foods, which sell a lot of craft beer, also aren't included, sources tell me. Bottleshops are in the same boat...not part of the mix, either. If you look at all the places craft beer is sold around the city in packaged form, you quickly realize the IRI data paints a partial picture at best. 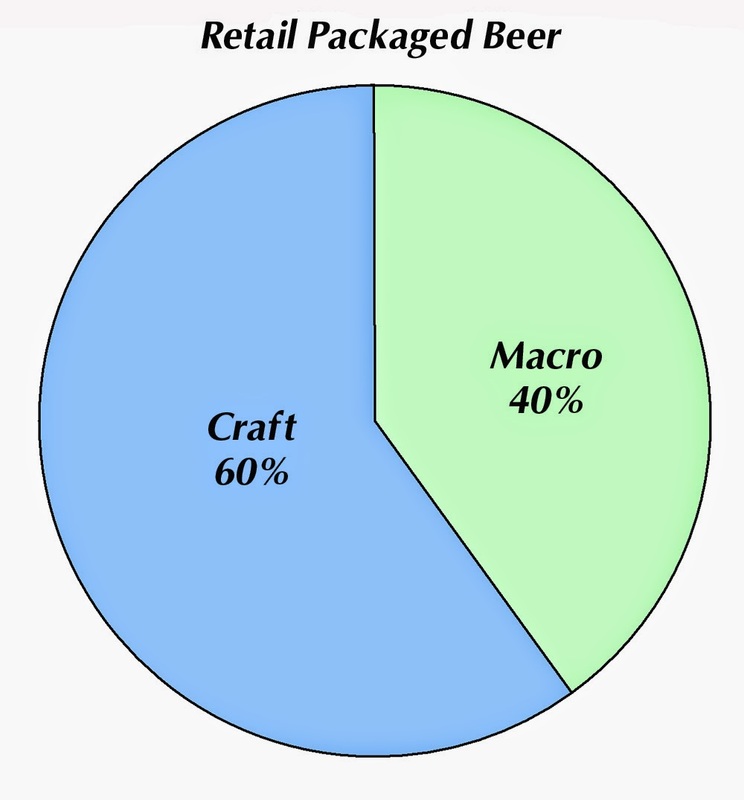 Instead of the 45 percent shown in last week's graphic, craft beer likely accounts for around 60 percent of dollars in packaged sales. Keep in mind that's for Portland. The number drops outside the city core, where yellow beer still has some appeal. Some people commented on the absence of draft data in last week's post. Draft is far more difficult to track than packaged sales for some fairly obvious reasons, and it isn't part of what IRI collects. In fact, no one really knows how much draft beer is sold in Portland. We just know it's a huge number. After talking to some industry folks, I came to understand the draft figure is much larger than I imagined. Portland's core consumes draft beer like there's no tomorrow. The national average for draft consumption in cities and towns is around 30 percent. A reliable industry source told me Portland's number is 50-60 percent by volume, over 60 percent in dollars. Another source said that number is probably accurate. One thing I need to mention is that no one seems to know where growlers fit in. This is draft beer sold for consumption off-premise. Brewpubs and beer-centric establishments that fill growlers surely track those sales differently than beer sold for on-site consumption. But we have no exposure to the numbers. Grocery stores are another matter. More and more stores fill growlers. Yet no one I talked to could tell me how those sales are tracked. I suspect Fred Meyer, which recently joined the growler craze, tracks growler fills alongside packaged beer sales, and passes that data on to IRI. It might be hard to extract growler fill data from packaged sales. So it's a blank page for now. 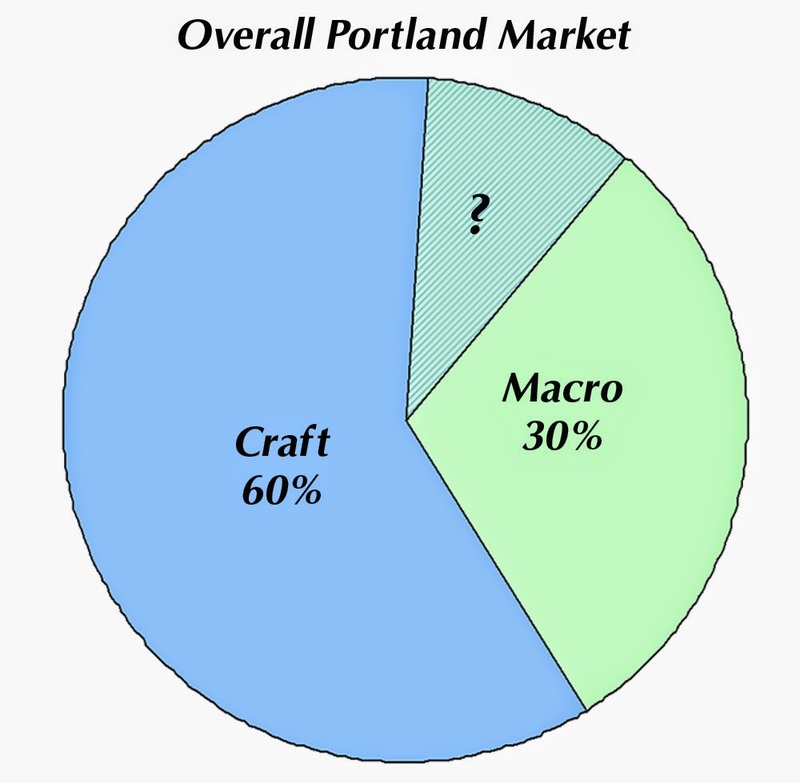 If you look at where craft sales are underreported or not represented in IRI data, you quickly realize craft market share in Portland is significantly higher than the 45 percent shown last week. Craft may have only recently passed the combined packaged sales of Anheuser-Busch and MillerCoors in IRI stores, but it has surely dominated the overall picture for several years, at least. Forming a statistical representation of the Portland beer market is a bit of a guessing game. That's because there's so much missing hard evidence. Nonetheless, looking at the likely scenarios for draft and packaged product, you have to conclude craft owns more than 60 percent of the PDX market in dollars. So the IRI numbers used in last week's post aren't wrong and they aren't even a crock, really. But they are so woefully incomplete that they present a skewed picture of what's happening. You have to look deeper. Given all that, we really ought to take another look at Seattle and San Francisco, the top craft markets in the country behind Portland. Both are probably craft-dominant at this point. If you could see data from all sales channels, both likely passed combined AB/MC dollar share a while ago. I'd be interested in the Boston craft market as well, with Sam Adams there.